OXFORD, Miss. – The Freeman Foundation of Stowe, Vermont, has awarded a $100,000 grant to the University of Mississippi for an initiative to support student internships in East and Southeast Asia. The program, UM Experiential Learning in East Asia, will allow 18 undergraduates to complete a summer internship of at least eight weeks in summer 2018. Each recipient will receive $5,000 from the Freeman Foundation grant and an additional $2,500 provided by the university’s Office of Global Engagement and the successful applicants’ respective UM school(s). “The Croft Institute has been the campus leader in promoting engagement with East Asia for the last 20 years, and this generous grant by the Freeman Foundation will allow us to add another important dimension to those efforts,” said Oliver Dinius, executive director of the Croft Institute for International Studies. Dinius will administer the program and is working with Joshua Howard, Croft associate professor of history, Minjoo Oh, associate professor of sociology; and Blair McElroy, the university’s senior international officer, to design the application process, select award recipients and assist students as they prepare for their internships. Headed by Mansfield’s grandson, Graeme Freeman, the foundation donates approximately $50 million annually to programs such as study abroad scholarships for Asian and American students and the National Consortium for Teaching About Asia, which has supported the Croft Institute’s efforts to strengthen teaching about East Asia in Mississippi for more than 15 years. The grant will provide students with life-changing opportunities to work and experience life in East Asia, Howard said. Participating students will “be able to put their learning into practice – whether it’s in the field of engineering, accounting, language studies, just to name a few examples – and become global citizens in the process,” he said. This grant will allow the Croft Institute and the other participating units on the Oxford campus to deliver on the university’s commitment to greater internationalization and support for experiential learning, two core goals set by Chancellor Jeffrey Vitter and Provost Noel Wilkin. 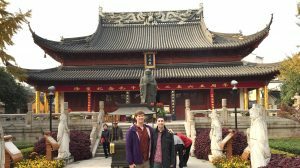 Students chosen for UM Experiential Learning in East Asia will learn how a foreign culture affects the work environment and help prepare them to succeed. “International experiences give students the skills they need in an increasingly global workplace, such as intercultural communication skills, self-awareness, knowledge of current events and their impact upon the world, and open-mindedness,” McElroy said. Interested students should find their own internship and apply for the UM-administered funding with a specific proposal. The program welcomes proposals for internships in all parts of East Asia, although priority is given to sending students to countries that are at the heart of UM’s long-standing engagement with East Asia: China, Japan and South Korea. Oh, a native of Korea, is excited about the potential of this grant reinforcing UM’s recent commitment to Korean studies. “I hope that many students will take advantage of this opportunity to complete internships in Korea, deepening our engagement with one of the most culturally and economically dynamic places in the world,” she said. The program is open to undergraduate students from all schools and majors on the Oxford campus. The only restriction is that they must be enrolled as full-time Ole Miss undergraduate students in the semester after completing their summer internship. Individual awards are designed to offset costs that may otherwise discourage students from interning abroad, including airfare, accommodations and meals. The program will begin accepting applications in mid-October. Interested students should visit http://www.croft.olemiss.edu/home/freeman-internships-in-east-asia for details about the application process and deadlines. For more information, contact William Mahoney, Croft’s coordinator for career planning, at mahoney@olemiss.edu.